Ryanair has increased the amount it charges its customers again, from 30th November. 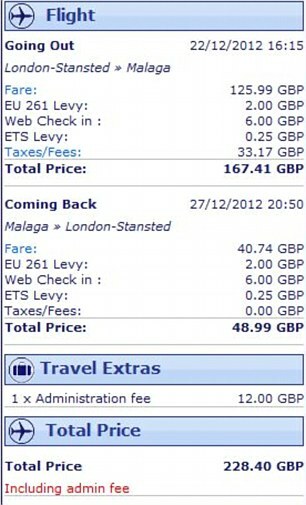 An article in the Mail sets out the charges now on a return flight from Stansted to Malaga, for one person. By comparison with Air Passenger Duty, which is only £13, the various costs and charges that Ryanair imposes (ignoring baggage etc) are £28.50 – as well as the cost of the ticket. And there is an extra 2% charge for using a credit card. Yet Michael O’Leary lobbies for less Air Passenger Duty. Ryanair charges a £6 admin fee for each flight, which will be included in the advertised price. So a family of four currently paying £320 for four return flights will see the advertised cost of those flights increase by £48 to £368. If they pay by credit card they will now also incur an extra £7.36 charge. Budget airline Ryanair has imposed a new blanket £6 a head ‘website administration fee’ on its customers – plus a 2 per cent booking fee on those who pay by credit card. Customers who pay by credit card face the double-whammy of having to pay BOTH charges, the no-frills airline confirmed. But Ryanair flew into a major row by claiming that the moves had been forced on it by UK competition watchdogs at the Office of Fair Trading (OFT) – a charge which they vociferously denied. Until now, passengers booking Ryanair tickets with either a credit card OR a debit card faced a £6 ‘admin fee’ unless they paid with the airline’s special pre-paid ‘Ryanair Cash Passport’. But the OFT ruled in July that this was unfair and that debit card customers should not pay an admin fee unless it is shown in the headline price. There should be no extra charge for paying debit card. So in retaliation, Ryanair says everyone will now pay the £6 admin fee – and credit card customers will in addition pay a new 2% booking charge. And it sought to blame the OFT for the added costs. It means a family booking by credit card faces its costs soar. The row erupted when the Irish no-frills carrier announced it was bringing in a new 2 per cent credit card processing fee on all new credit card bookings made from Friday. It also announced that from Friday its passengers would also have to pay a £6 administration fee to cover the airline’s ‘website costs’. The airline claimed it was making the announcement ’in order to comply with the UK Office of Fair Trading’s recent ruling on credit card fees’. Ryanair’s Stephen McNamara said: ’Ryanair is disappointed, but not surprised, by the OFT’s attempt to distance themselves from their anti-consumer rulings. ‘Before the OFT imposed these baseless changes, airlines could partner with card providers to allow their cardholders the exclusive advantage of avoiding such fees. But a furious Office of Fair Trading (OFT) issued a strong denial saying this was absolutely not the case and that the extra charge was totally unnecessary. However, the move came as Ryanair WAS forced by the competition watchdogs to scrap unfair charges on debit cards and to remove a lack of transparency in the booking process which saw unfair charges ‘sprung’ on passengers at the last minute. Those using Ryanair’s ‘cash passport’ scheme in Ireland, Germany and Spain will be able to avoid administration fees until February 1, February 15 and March 21 2013 respectively. In July the OFT told 12 airlines, including Ryanair that they could not charge a fee to customers paying with debit cards, which were considered the same as cash. At the time Ryanair charged a £6 card fee per person per booking, it said. Nor could they allow only their own debit cards to be used. He said Ryanair’s ‘avoidable’ 2% credit card fee can be avoided by using debit cards (including Ryanair Cash Passport cards) or German ELV transfer. Ryanair and its outspoken chief executive Michael O’Leary has already come under fire from consumer groups and aviation watchdogs for luring customers in with low fares then charging sky-high fees for ‘the extras’ – and has even threatened to charge for use of the toilets. But the opinionated airline chief has no sympathy for other passengers who fall foul of his tightly drawn rules. Recalling the recent case of passenger and mother-of-two Suzy McLeod, who received backing from nearly half a million Facebook users when she was forced to pay £236 to print boarding passes for her family so they could fly home to Britain from Alicante, Spain. Mr O’Leary told ‘Management Today: ‘Recently a customer turned up at Alicante with no boarding passes for her family. ‘She was fined €60 for each reissue. So she gets on ‘the Twitter’ to complain. The mother-of-two, from Newbury, Berkshire had criticised Ryanair’s rule that travellers must print boarding passes up to two weeks before flying, or face a £60 per ticket charge at the airport. At the time of the boarding card row Mr O’Leary launched an astonishing rant against his own customers – branding those who don’t like paying for their boarding cards as ‘idiots’ who should ‘b***** off’. Passengers who arrive for flights without a boarding pass are ‘stupid’ and should pay a penalty to have one printed at the check-in desk because it is their ‘f*** up’.